With the latest engine technology and features that help to provide a dense, high-quality mat, the CR30B and CR35B are the ideal fit for small-scale compaction projects. Volvo Construction Equipment launched the CR30B and CR35B combination rollers at World of Asphalt, adding to its small asphalt compaction line. These versatile machines are powered by a fuel-efficient, low-emission engine and packed with features that deliver a smooth and dense mat surface. Built on the platform of preceding models, these next-generation machines can be used in a variety of applications, such as driveways, small paths, patchworks or shoulders on roads. Whatever the job, the CR30B and CR35B deliver a dense, high-quality mat surface thanks to the combination of two compaction methods. The machines use the high-frequency vibration of the front drum to achieve density targets, and the four pneumatic rear tires manipulate the compacted material, ensuring impermeability and smoothness of the mat, according to the manufacturer. Both models are powered by a Kubota 49.6 horsepower low-emission, fuel-efficient engine. They meet Tier IV Final emissions regulations and feature a passive regeneration system that cleans the filters automatically, thereby eliminating the need for the machine to stop or for operator input. Fuel use is further reduced due to the optional auto-idle feature, which reduces engine speed when controls are inactive for more than 60 seconds. 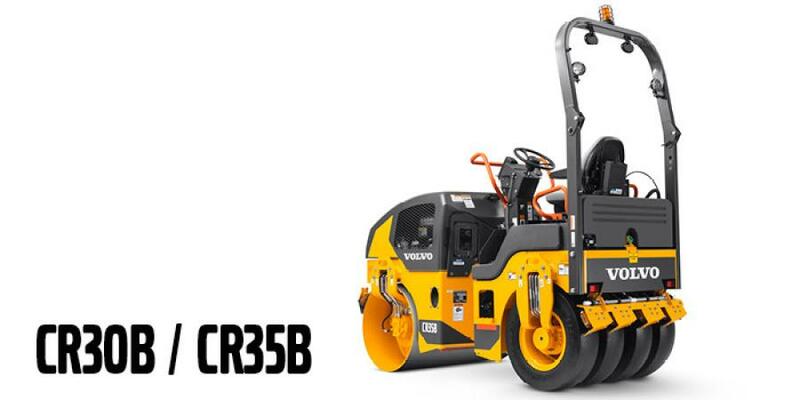 The CR30B and CR35B combination rollers offer consistent compaction due to a handful of advanced features. The auto-vibration feature automatically engages vibration when the machine reaches 1.5 mph and disengages when the speed drops below 1.2 mph, for reduced risk of over-compaction. Optimizing finished pavement quality, the drum edges are chamfered and rounded to avoid marking the mat while rolling. The pressurized water spraying system and a separate emulsion tank prevent material pick-up. The operator can easily adjust the water flow rate and emulsion flow rate independently, for greater productivity and ease of use. Ease of operation is enhanced by the new side console and display, enabling operators to make adjustments on the fly. The operator seat can also slide laterally according to individual preferences and jobsite requirements. For increased rolling precision, the engine hood is sloped, offering a clear forward view of the job site, as well as unobstructed sightlines down to the drum and spray bars. The new combination rollers promote uptime through durable components and simple maintenance requirements. The 79-gallon water spraying system increases time between refills. The low positioning of the water and emulsion tanks enable them to be quickly and easily filled from ground level. And the hinged hood provides clear access to the engine, hydraulics, fuses and relays for swift and convenient servicing. Volvo also offers a range of solutions to optimize machine uptime and reduce operating costs. The CR30B and CR35B are Tech Tool and MATRIS compatible, helping speed up diagnostic time. CareTrack, the Volvo telematics system, is also available as a factory option for proactive machine monitoring.